Roary, Maxi, Conrod, Cici, James or Drifter? We at Go-Kart Party absolutely love racing and have taking a particular liking to the tv show Roary the Racing Car. Roary the Racing Car, the much loved children’s cartoon, follows the lives and adventures of a group of racing cars and joins them on their laps around the Silver Hatch track. Although a made up name, it was actually inspired by the famous Grand Prix tracks, Silverstone and Brands Hatch! Roary and his pals are great fun and like us, these larger than life characters love nothing more than to hang out and go for a spin around the race track. They come in a range of styles and colours from bright pink to a vibrant red and blue. And with so many awesome cars to choose from, Go-Kart Party would like to know which racer are you? Roary’s the young energetic racer. The newest member of the group, this bright red racer loves nothing more than a good challenge. He can often be spotted sporting a white and red number one sports cap, which matches nicely with the number one painted on the front of his car. 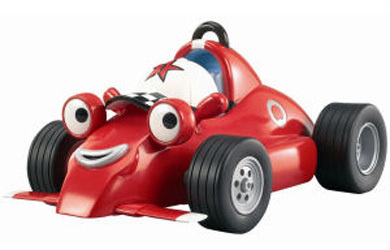 Roary’s an enthusiastic racer, whose picked up bags of new skills and ready to dazzle at his next race. Cici’s aka zizi is a bright pink and purple stunt car from France. She’s a bubbly character, with superb tricks and lightning speeds. Cici is straight up fabulous with a distinctive number 3 painted on her doors and bonnet. She’s a spectacular racer and thinks you just might have trouble keeping up with her. Maxi is a Roary’s older brother. He’s a bright yellow formula 1 racing cart, with bags of experience and a load of tricks. His perfectionist who can usually be overheard given Roary tips and helping him perfect his skills. Maxi is often be seen out and about wearing cool shades, and a blue and yellow sports cap. When he starts a race, flames erupt from his exhaust! Conrod is a red and silver V8 race car. What’s really exciting is that this character is actually voiced by the Australian V8 Supercar champion Craig Lowndes! Conrod is noisy sports car who likes to make a big entrance to the racetrack. He simply can’t wait for his next race. His a classic sports car, a silver Aston Martin DB5 to be exact. James is a ultra cool racer, complete with superb gadgets and gizmos, including an ejector seat, umbrella and water cannons. Or are you Drifter ? … So boys and girls, which racer are you? Why not choose your car and join the Go-Kart Party!